Jackie McNamara believes he should have been given more time to turn things around at Dundee United. 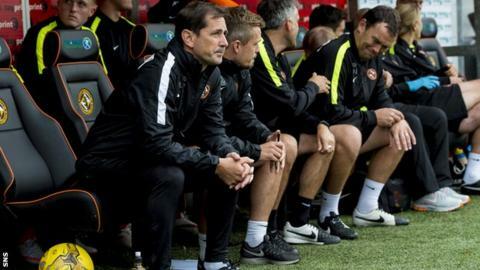 The former Celtic and Scotland defender was relieved of his duties as Tannadice boss last year after just one win in the first nine games of the season. McNamara, now York City manager, holds no grudges against United but insists his record was second only to 1983-title winning manager Jim McLean. "The last six months at the club weren't nice," said the 42-year-old. "But everyone has their time in the firing line and I'm a stronger person because of it." Ex-Partick Thistle boss McNamara spent over two years on Tayside before being replaced as boss by Mixu Paatelainen in October. "I regret certain things but a lot of other things were out of my control," he explained. "The club was in a bad position at the time and I inherited other people's problems." McNamara led the Tangerines to three top-six finishes in the Scottish top flight and two cup finals but lost key players with Ryan Gauld, Andrew Robertson, Gary Mackay-Steven and Stuart Armstrong sold on. And he insists the plug was pulled too quickly during what he described as a longer term project. "I think every manager would say that is the case, but yes, for me yes," he said. "In Scottish football there is no-one else who lost players like we lost or moved on. "My record at United speaks for itself in terms of win ratios and getting to finals. "I think it is second only to Jim McLean in the club's history." United are 11 points adrift at the bottom of the Premiership having won just three times in the league since changing manager. McNamara seems to have found peace in Yorkshire, even if the pressure to avoid the drop has followed him south. York sit third bottom of League Two but recent results seem to suggest he has turned things around. But does he have an eye on returning north at some point? "Not at the moment," he said. "I'm enjoying being away from certain things although it's hard being away from the family - I'll look at bringing them down in the summer." McNamara claims no other manager in Scotland had to deal with the loss of key players the way he had to during his time in charge at Tannadice. The club have just posted a healthy profit but when the former Celtic and Scotland defender arrived in early 2013, the club was in a very precarious financial position and the books had to be balanced. So as United stare relegation in the face with a bulging bank balance, what could their side have looked like if money wasn't an issue under McNamara?